From The Catholic Thing, a brilliant daily article. Fr. 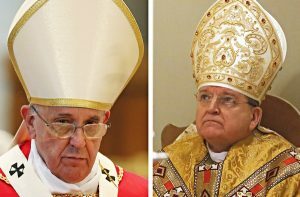 Mark Pilon notes that the pope’s refusal to answer four cardinals dubia about Amoris Laetitia is splintering the faith. It’s not schism.Yet. The letter of the four Cardinals to Pope Francis, and the decision to go public with this document certainly constitute a stunning affair in the history of the Church. When has anything like this ever taken place? There’s the sad history of Ignaz Von Dollinger, which eventually led to his excommunication, but Dollinger was simply a priest-historian, and no Cardinals ever joined his challenge to Vatican I’s solemn teaching on papal infallibility. This present event is a dramatic challenge to Pope Francis who, ironically, has several times called for a shaking up of the Church. The Cardinals are all well respected and strong supporters of the papal primacy and the papal office of teaching. Their letter to the Congregation for the Doctrine of the Faith is a sincere effort to gain some clarity on positions advanced in Amoris Laetitia. For their troubles, the head of the Roman Rota has openly threatened them with loss of their status as Cardinals.